These days there seems to be a lot of emphasis on long course triathlon. Finishing an Ironman is an amazing goal to have, but if you have no desire or are not quite ready to make the jump in distance, short course events like sprint and Olympic races will make up your race season. If this is you, and you have big goals for 2014, focusing on these key elements will help you reach the next level this season. 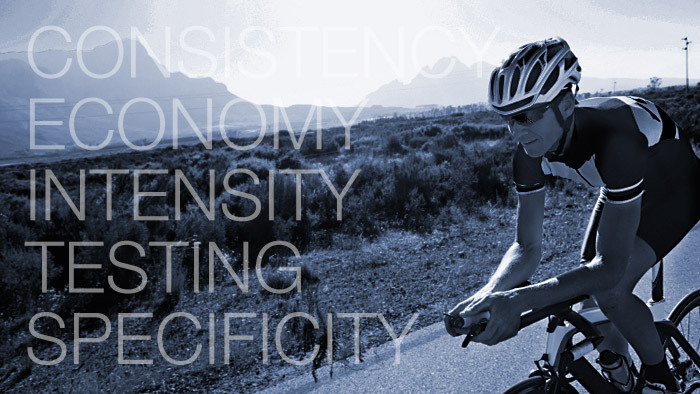 The number one fundamental in how to improve your performance simply comes from consistency in your training. Riding for 45 minutes to an hour each day has much greater benefit than cramming all of your training into one or two days over the weekend. This is because consistency creates the healthy, progressive training load required to adapt and get stronger. Training intermittently and too hard can cause detraining to occur between training sessions, and an amount of overload on the body that is too great for short term recovery. Build economy into your training so that you can go faster at the same effort. Being more efficient is critical for your overall finish and performance, and might be the most overlooked aspect of your “fitness” during daily training. If you only focus on producing more power without looking at ways to use less energy while you produce that power, then you are missing out on what could be the key to your strongest finish and fastest result. This applies to not only swimming where you should have a sound technique before building fitness but also cycling and running. Your cycling position and cadence, for example, may have a dramatic impact on how well you run off the bike. Your running success is determined by decreasing the cost of running, improving form and preserving the kinetic energy in your stride. Economy is a key element at any distance, so should you decided to move up to a longer distance the economy you build racing shorter events will still pay off. While many of your friends may brag about their marathon training sessions on the weekends I’d suggest you focus on intensity and race specific, high quality workouts. Although some combination of volume and intensity are needed for success- it is the intensity, not the volume of your training that is the better predictor of performance. Perform field tests in each discipline to gauge performance improvements, adjust your training to address deficiencies and reset training zones. I recommend that field testing be done more frequently in your weaker disciplines to ensure progress is being made. Know the event/course you are training for so that your training can mimic and stress the appropriate physiological systems to achieve the specific training adaptations needed for peak performance. Some events favor stronger open water swimmers, other events have their own keys to success whether it being a hill at some critical point on the course or some other feature or the race that you need to be prepared for. Knowledge is power and timing is everything. The closer you are to race day the more specific your training needs to be. Your body needs to be able to effectively and efficiently prepare itself for the next demand and then recover from and forget about the task it just completed. Brick workouts help you get used to this dynamic and also train your body to handle the aerobic, anaerobic and muscular demands that you will experience during these important parts of the race. Every second counts and a fast transition will not only improve your time but it can also dramatically change your results. A quick changeover can break the spirit of a competitor who has been hanging with you and it can launch you up in front of others that you have been killing yourself to pass. Confidence and proficiency are achieved through repetitive action over time. Make T1 and T2 skills an ingrained habit that will be automatic on race day. A goal without a plan is just a dream. Refine your nutrition plan in training on a daily basis, know what you need when and anticipate it. About a week prior to the race develop a race plan and execute it on race day by controlling what you can and staying in the present. Do not underestimate the importance of mental toughness. The closer together the mental and physical limits are, the better your performance will be. Start today to implement these suggestions into your training plan and you’ll be on your way to improved performances for the coming season.